Apply NowApplications are accepted throughout the year for journeyman, postdoctoral and senior fellows. Summer program and short-term fellowship deadlines are listed in the project description. 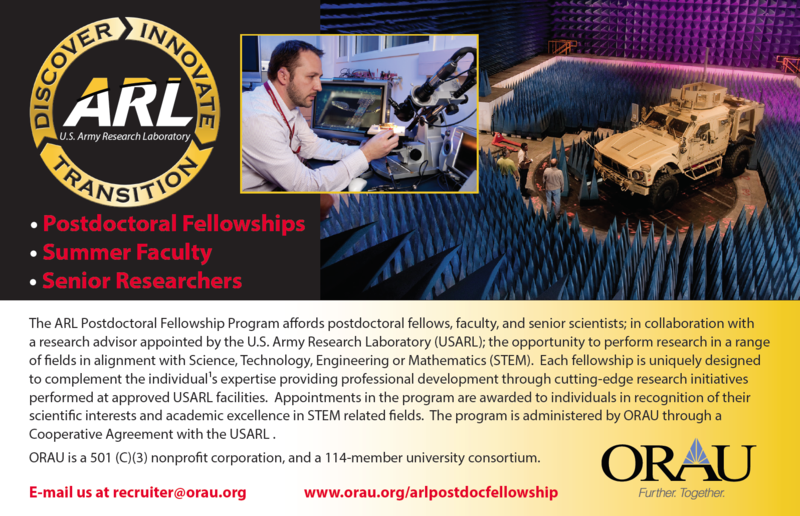 U.S. Army Research Laboratory (ARL) Research Associateship Program (RAP) Summer Student Experience is an educational program that allows students and recent graduates to participate in a paid research experience at a Department of Defense laboratory over the summer break. Non U.S. Citizens are strongly encouraged to apply by the first round deadline to allow as much time as possible for processing. Tentative dates of appointment – May 13-September 30. A candidate for the student component must be in good standing (a minimum of a 2.5 GPA) at an accredited university or technical institute, and in an academic program leading to an undergraduate or graduate degree. Each opportunity description will identify the project’s ability to consider non-U.S. Citizens. Complete the online application form and submit it to the Summer Student Experience projects. Please note, you must use the applicant profile to apply against a Summer Student Experience opportunity, not just create the profile and upload your materials, to be considered. Resume - Please list your relevant coursework and lab work on your resume as well as all papers, presentations, or publications you may have authored or co-authored. Include any reprints or abstracts if they are available. Transcripts - Transcript verifying receipt of degree/or identifying current enrollment. Original student copies are acceptable. Statement of Interest - Write a one-page description of your scientific research experience. Please include references to your lab work as well as any relevant academic coursework. How does this experience intersect with your personal and professional goals? References - Reference forms are not required for the Summer Student Experience, but names and contact information for references are part of the online application. During the review process, some Advisor/Selecting Officials may contact references for further evaluation. If you have any questions about the Summer Student Experience at ARL, please the contact ARL-RAP recruiter, Krystle Wagemann.